Learn what you need to know about business insurance for cleaning services. This insurance protects various types of businesses and sometimes is called insurance for small cleaning business, home cleaning insurance, janitor insurance (including janitor liability insurance), window cleaning insurance or laundry business insurance. Why is it important to protect your business with liability insurance? It does not matter what type of cleaning services you do. The truth is that you have many risks awaiting you – potential damages to other people’s property (e.g. equipment, electronics, art, collection items and expensive items), along with damages and scratches to the building itself. An additional danger is a potential injury risk – such as when somebody slips on a wet floor. Professional liability insurance for cleaning or janitor services is the most essential part of your protection. Below are some examples from various industries. Do you recognize some of these dangers? These are just a few examples justifying insurance for cleaning and janitorial businesses. If there is one insurance type you should be considering, it is liability insurance for your services. 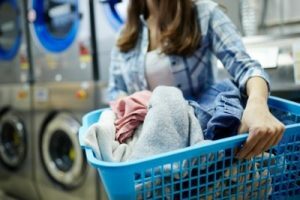 When getting a cleaning business insurance quote, you need to consider various risks that your cleaning, janitorial, laundromat or dry-cleaning business may face. We have compiled an overview of all possible insurance types that you might need. The first one, commercial professional liability for your cleaning services, we have already discussed, so let us explore other ones. Breaking a precious vase when cleaning up a home. Damaging equipment when wiping dust. You need this insurance if you have one or more vehicles that you or your staff members use to get to the client’s site. Should you have more than five vehicles, you will need a fleet insurance. Find out more about fleet insurance here. Sometimes Your staff has an accident when driving in your company’s vehicle to the client’s office for regular cleaning. If you have several cleaning staff members or janitors working for you, you might want to consider getting group insurance – a combination of health benefits, life insurance, disability insurance and, potentially, some other insurance coverages (various packages are available on the market). Should you be interested in this insurance type, please click here to get a group insurance quote. Personal Injury insurance for cleaning businesses only covers some of the medical services you might need after a work-related injury. Sometimes A cleaning staff member slips on a floor and injuries him/herself. 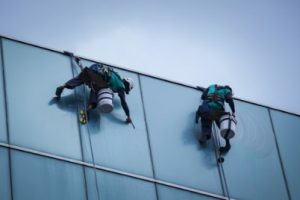 Commercial property insurance for cleaning services covers all unexpected damages to the buildings which you or your cleaning staff might cause while cleaning. Some of those damages can be quite costly, especially if you are dealing with high end office spaces. Sometimes The floor cleaning/polishing machine is not working properly and has damaged an expensive marble floor. If your cleaning business, drycleaning service or laundromat owns the building it is operating from, you will need this insurance to protect the building. Rarely Consequences of fire or flooding in the laundromat building that your company owns. Insurance rates for different cleaning businesses vary considerably. Here are some examples of cleaning service insurance costs for various scenarios. Remember that this is just a ball park – please get a quote to receive rates that are tailored to your particular janitorial business or cleaning services. If you provide home and house cleaning services, insurance should be on your mind. Some clients will ask for it, and without having it, you risk losing your job with that client. Others will not ask for it, but you would better off having it. Imagine breaking a large vase, damaging the Bohemian crystal or dropping a floor stand filled with a collection of wines? Costs for these items can add up to thousands of dollars. Do you really want to be on the hook for this amount? Getting a home and house cleaning insurance policy will save you a lot of headaches in the future. The same applies if you are a freelance janitor or window cleaning professional. Our experienced insurance professionals will inform you about possible insurance options and will find you the lowest insurance rate.